The Department of Elections declare their vision to be the protection of democracy of the country through conducting free and fair elections and referenda. A free and fair election is primarily one that provides opportunities for every eligible citizen to exercise his or her vote on an equal basis with others. Every single voter has the right to exercise the vote that is his or her democratic entitlement. Persons with Disabilities are often deprived of this right, not due to their disability, but due to the barriers they face in the electoral process. Lack of access to polling stations, non-inclusive electoral registration systems, unavailability of data and lack of knowledge on the importance of being a part of the electoral process are some of the barriers faced by persons living with disabilities. Not only that, candidates have been unable to recognise the votes of persons with disabilities and often neglect their concerns in their election campaigns. In this background, the recent steps taken by the Commissioner of Elections is one giant leap forward in ensuring the electoral rights of persons with disabilities. What is most important is that the current Commissioner has been able to divert successfully from the popular ‘charitable’ approach towards disability practised by many citizens as well as public officials in the country. The initiatives taken by the commissioner are admirable in that he strives to ensure that every eligible citizen receives the same opportunity to take part in the elections on an equal basis. The steps taken by the Department of Elections include the provision of transport facilities for persons with disabilities to reach the polling station, ensuring that polling stations are located at the most accessible venue available in the designated centre and making arrangements to transport persons with disabilities from the entrance to the polling booth in instances where such locations are not available. In addition, the Department and the Commissioner himself is making sure to highlight the issue of disability in their media statements. 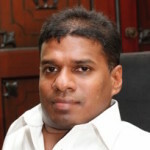 Mr Mahinda Deshapriya thus becomes the first ever election commissioner of Sri Lanka to take steps to ensure equal participation of persons with disabilities at the electoral process. This is indeed a historic step for the Department as well as a great achievement for the persons with disabilities in Sri Lanka. The Commissioner sets an example to all the other public officials in the country on creating inclusion. This proves that mainstreaming of disability is not an impossibility as long as the institutions and individuals have a sensitivity towards the issue. What is needed is the willingness to recognise abilities of all persons with our without disabilities and to ensure that everyone, regardless of these abilities are provided opportunities of participation. Sorry this is not about your article. Are you originally from Bibile? I lived in Pannipitiya and one 8-9 years old happy, smiling Senarath stayed with us.. If you are the same Senarath or different guy, I am so happy and proud about you. Hi Anura ayya, yes it is the same Senarath. Could you share your email/contact no.s with me? It is very nice to hear from you. I just read your previous article too.. This is kind of test email but I will check it in the next couple of days. I live in Melbourne. Left SL long long time back, 2 years after my Uni. The “transport” of a disabled voter enabling him first to be identified, then to be finger-inked, and then up to the Senior Presiding Officer’s table, to receive the ballot paper, then to the polling booth, were functions allocated to polling station staff, usually the peons, in past elections from the sixties. The SPO also assisted in the marking of the ballot paper by the voter or, marked it as desired by him, in the privacy of the polling both. I hope that this process exists even now. I don’t think such sensitive and sensible procedures are continued as of now. I’ve been partaking in elections as a voter for the past 8 years and not even once they assisted me in that manner. FYI: I’m a person with a visual impairment. My polling station of course was not anywhere in the western province but somewhere in the north-western province. Do you think this might as well be related to the cliche sort of discrimination called ‘Kolambata Kiri Gamata Kakiri’ phenomenon? All depends on the Returning Officer – the GA in the old days – for the province/district/electorate, and the SPOs. He had a briefing for all SPOs one week before, and all were given ‘election regulations and procedures’ – booklet. The Assistant Returning Officers – ‘AROs’ – toured all polling stations to bring procedures up to date. This is precisely why the regulations have to be put in place. So that persons with disabilities will not have to depend on anyone for the exercise of their democratic right. If the laws and procedures provide them the right and the voting process is made mandatorily inclusive, we would not have to depend on the personality of the polling officers to exercise our right.